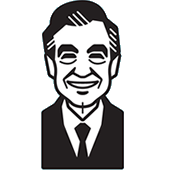 Mister Rogers arrives with a flashlight and demonstrates how it works by closing the blinds and turning off the lights. Pulling out the sofa bed and a pillow, he pretends that it is night time. After Mister Rogers politely takes a wrong number phone call, he continues to observe the darkness when Mr. McFeely arrives with a delivery -- a video cassette about how people make flashlights. Together, Mister Rogers and Mr. McFeely look under the sofa bed with the flashlight before they watch the film. Before leaving, Mr. McFeely leaves an audio cassette with Mister Rogers -- Sounds of the Night. It is almost nighttime, in the Neighborhood of Make-Believe as King Friday and Handyman Negri are playing some music at the castle. Lady Aberlin arrives looking for batteries for her flashlight. While Handyman Negri finds the batteries, Lady Aberlin talks about her fondness for the nighttime. Once her flashlight is working, she invited to the tree by a very disturbed X the Owl. Inside the tree, X shares that he is angry that Lady Elaine has showed up unannounced at his tree and frightened him. Lady Elaine learns that such behavior is not okay, even if she has been to X's tree in the past. After apologizing to X, Lady Elaine mentions that "there are falling stars." A telecan call from Daniel requests Lady Aberlin come to the clock where she finds a very worried tiger. Daniel has learned of falling stars from Lady Elaine and is concerned that one will land on his clock. Back at the house, Mister Rogers opens the blinds and folds up the sofa bed before receiving a telephone call from the host of a childrens' television program in another country who will be visiting the Neighborhood later in the week. Mr. McFeely delivers an audio cassette -- Sounds of the Night -- which is mentioned but never played. When Lady Aberlin is invited inside the tree, she mentions that the knot hole is obviously too small for her to enter. Luckily, according to X, "There's a bigger door for creatures [her] size around the back."